When planning to go and buy anything, basic information and knowledge on that product is a must-have. When it comes to buying a scooter, this basic rule still applies. In a market full of different and a wide range of scooters to choose from, one must actually know what is it that they are looking for. You must have criteria against which you are gauging the various scooters. This will ensure that you not only get the best scooter but also get the scooter that can actually work for you. Most people get frustrated after buying a scooter, only to realize later that, the scooter they bought is not actually what they needed. This leads to money and time wastage as they go back to the market to hunt for another ideal scooter. It is for this reason that we write this informative article on EcoReco M5 E-Scooter review to give you all the information you need to know about this top rated scooter and to help you make the right decision. EcoReco M5 E-Scooter is an efficient and also portable electric scooter weighing around 47 pounds. This electrical vehicle gadget is suitable for use mostly in urban areas and is very popular with the urban folks who prefer a feel of the wind and cool air as they ride around the tarmacked areas and around the cities. It is regarded as an environmental friendly gadget as compared to the other electrical traveling gadgets such as the normal vehicles. EcoReco M5 E-Scooter provides a very convenient and economical means of transport as it consumes very little energy as compared to other types of scooters and vehicles. It is convenient in that, you can always use it whenever the need for traveling arise and it is, therefore, better than relying on the public transport services. If you are that person who loves his travel escapades to be full of fun, thrill, and adventure, then this is the type of scooter to own! Quality frame– EcoReco M5 E-Scooter is made up of a stable frame that is made of aluminium. This quality frame increases the lifetime of this electronic vehicle as it does not wear out easily. This means that you don’t spend a lot of money on repairs or on purchasing a new gadget hence making it a very economical device to use. Battery cycle life– EcoReco M5 E-Scooter has a relatively long cycle of battery life. This gadget boasts of more than two thousands cycles of battery life which is a good number as compared to other battery cycle lives in other gadgets or scooters. External charging system– Unlike many other scooters, EcoReco M5 E-Scooter comes with an external charging system that is mounted at the top part of the gadget. This means that you are able to re-charge your scooter and go on with your journey. Customized speed limits– EcoReco M5 E-Scooter usually comes with a pre-configured speed of 12 MPH as its top speed. However, depending on your need and desire, you are able to customize or configure your scooter to other speed limits such as to 7 MPH or even 20 MPH. It is all about your preference and the distance that you want to cover over a given period of time. LED backlit dashboard– The EcoReco M5 E-Scooter has a LED backlit dashboard that makes the features such as the speedometer on the dash visible against the background whether in light conditions or in low light conditions. Universal mount capabilities– EcoReco M5 E-Scooter has universal mount capabilities that allow you to mount your Go-Pro, your camera or any of your desired accessories. If you are that person that fancy taking pictures or videos as you ride, then this is the scooter to buy. Easy to recharge– Unlike many other scooters, this scooter is very easy to charge with an externally installed charging system. The scooters take a very short time to charge. Normally, this scooter takes around two hours for eighty percent charge input and only four to five hours for full battery charge. 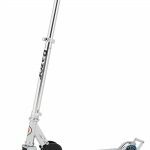 Easy to handle– EcoReco M5 E-Scooter is light in weight, weighing around 36 lbs. This makes it so easy to handle, control and carry around. No frequent charging– This gadget, unlike many other scooters does not require frequent charging. This is because it only uses a little energy and can cover up to a distance of twenty miles after every new charge. This means that you can actually cover a good distance without the need to recharge arising hence making it a very efficient and reliable traveling gadget. Although this scooter is arguably one of the best scooters around, it has one shortcoming in that it is not equipped with a horn or even lights. The absence of these two features sometimes makes the rider feel unsafe. However, it is possible to add the front light on your own if you think you need it. 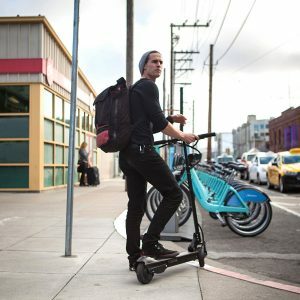 EcoReco M5 E-Scooter is among the top most and efficient scooters around. 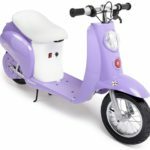 However, before you buy it, you should ensure that you are getting it from a legit and licensed dealer to ensure that you are not conned or tricked to buy something that is not actually the original version of this scooter. Also, it is very important that you know how to use this scooter to avoid damage or accidents.